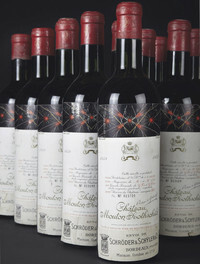 A 1.04 million-pound ($1.6 million) wine sale today will lure collectors with rare Chateau Mouton Rothschild and Lafite Rothschild bottles as the international wine investment market continues to recover. The lots from top Bordeaux producers spanning more than a century will be offered at Christie’s International in London with vintage ports dating back as far as 1908. Demand for wine is picking up after a slump in the last four months of 2008 during the global financial crisis. The Liv- Ex 100 Index of fine wine traded in London has rebounded 47 percent since the end of 2008 and 27 percent since the start of this year, helped partly by demand for the Bordeaux 2009 vintage.